Gazprom and Turkey have agreed the general route for the onshore section of the Turkish Stream pipeline. The first line of the 180 kilometer pipeline is expected to be completed by December 2016, according to company CEO Aleksey Miller. "We have identified and put on the map also the on-ground passage of the Turkish Stream gas pipeline for further exploration and project work," Miller told journalists on Sunday. "This is the key news." Landfall will be near the village of Kiyikoy, and a delivery hub for Turkish consumers will be close to the town of Luleburgaz. The pipeline will terminate on the Turkish-Greek border in the area of Ipsila. Permission to carry out design and survey work in the new Turkish offshore section is expected soon. 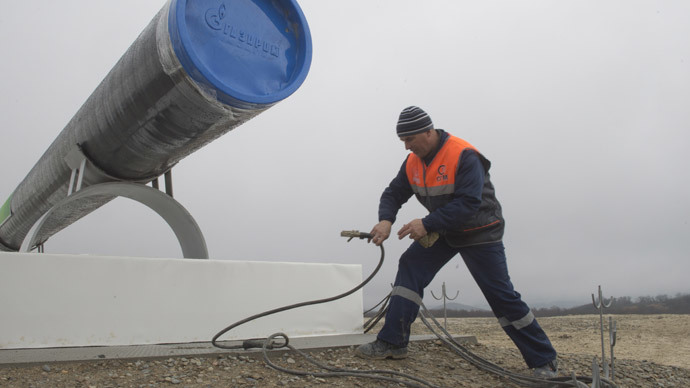 Gazprom is ready to supply 47 billion cubic meters of gas per year to Europe via Turkish Stream, it said in a statement. "We’ll direct the capacity of the gas pipe’s first line, 15.75 billion cubic meters, fully to the Turkish market. Considering the degree of readiness of the Russkaya compressor station and the larger part of the route, this timeframe is absolutely realistic," said Miller. On December 1 Gazprom and Turkey’s Botas Petroleum Pipeline Corporation signed a memorandum of understanding on the construction of the gas pipeline from Russia to Turkey under the Black Sea. Turkish Stream is an alternative to the South Stream project cancelled by Russia in December 2014 due to the EU’s unwillingness to support the 63 billion cubic meters capacity pipeline. The route of Turkish Stream across the Black Sea will match much of that previously agreed for South Stream.